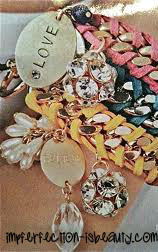 So I came across these gorgeous to die for bracelets. I don't know what it is but I'm definitly in a hippie mood this summer. Crop tops, long flowing skirts, and tons and tons of mixed matched bracelets. These aren't just any bracelets. These are Mix It bracelets. They come in so many different styles, colors, and some even are paired with a few others. I'm most excited about these bracelets because they are leather wrapped with gold and have charms hanging from them. I just want them all! So get yours today I got mine at JCPenny! !